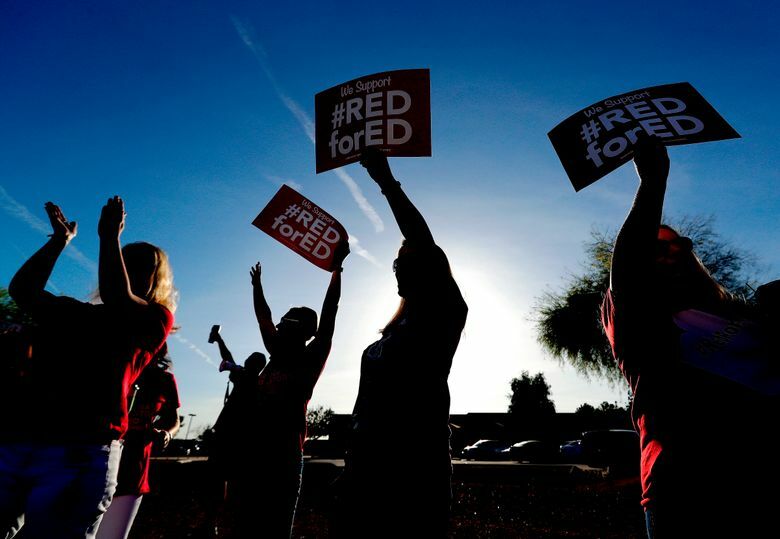 PHOENIX (AP) — Arizona policymakers have yet to agree how to increase teacher pay or education funding ahead of a first-ever statewide walkout this week, prompting calls from Democrats and even one Republican to generate new tax revenue in the conservative state. Republicans who control the state Legislature have yet to fully back Gov. 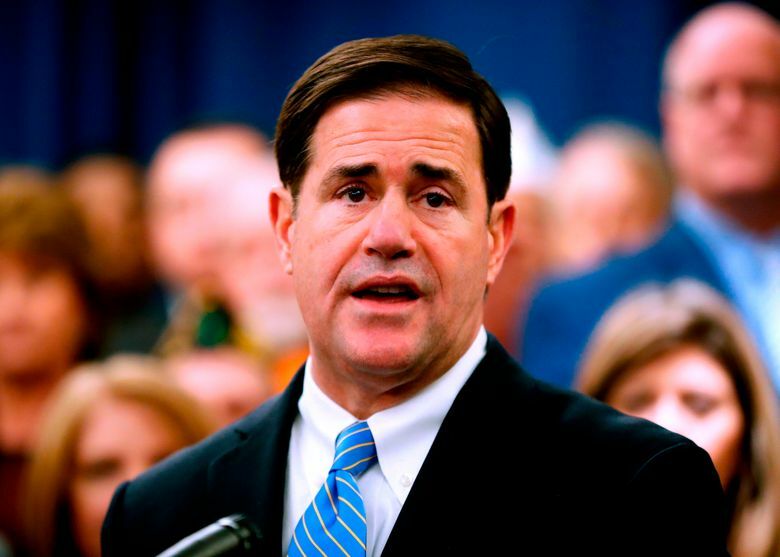 Doug Ducey’s plan for a 20 percent teacher raise, which would cost $650 million by 2020. Many have shared concerns about the rosy revenue projections Ducey is using to cover the increase. Teachers have protested for weeks and took a vote on whether to launch the first statewide strike after Ducey unveiled his plan, saying they’re concerned it doesn’t increase funding for classrooms and students. With Ducey and legislative leaders meeting behind closed doors to negotiate a deal, Republican state Rep. Noel Campbell offered a plan for a sales tax increase. He said the three-year boost of 1 percent would generate $1 billion annually. Campbell said he’s concerned the governor’s proposal is too optimistic and believed the hike would bring in money to support all-day kindergarten, technical training and lower in-state tuition at public universities. Most lawmakers agree higher pay and school funding is a good idea — the issue is how to fund them, he said. The governor and many Republicans have taken pledges against tax hikes. The relative novelty of a Republican calling for a sales tax increase contrasts with Democrats warning against any such hike. They raised concerns about rural towns that already have 10 percent sales tax rates. “Another increase would unfairly put the burden on the poor and working class, who pay an inordinately larger share of their income on sales tax,” Senate Minority Leader Katie Hobbs said. Instead, Democrats called for funding from new revenue streams, such as taxing new products or reversing income tax cuts on wealthy residents. New dollars are necessary to meet a key demand: $1 billion to return school funding to levels seen before the Great Recession, said Joe Thomas, president of the Arizona Educators Association, the largest teacher membership group. Ducey spokesman Daniel Scarpinato said the governor’s plan goes a long way toward addressing classroom funding concerns. It includes $371 million phased in over five years that districts can decide where to direct — that money could be used for support staff raises or other needs, Scarpinato said. The political dealing comes as some of the state’s largest school districts plan to close Thursday and Friday due to striking teachers, who are among the lowest-paid in the U.S.
Over a dozen of Colorado school districts, including the 10 largest, also will shut down both days because of teacher protests. The two states are part of a movement that started in West Virginia, where a strike garnered a raise, and spread to Oklahoma, Kentucky and beyond. 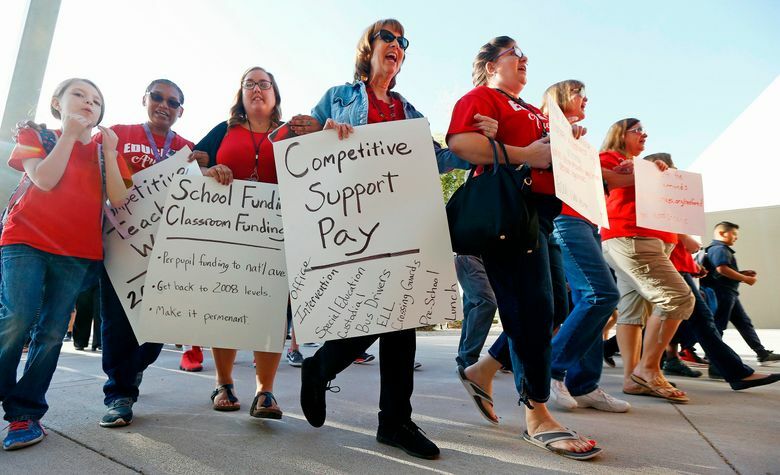 In the run-up to Arizona’s statewide strike, parents and community members have been supportive, said Melissa Girmscheid, a science teacher at Centennial High School in suburban Phoenix. They’re giving gift cards for support staffers who may not be paid, and some teens are volunteering to watch teachers’ children so they can go to a rally Thursday, she said. “We’ve had a lot of parents who’ve stepped up to the plate,” Girmscheid said. Thomas, with the teachers association, said teachers were pushed to the drastic step.